Sometimes this project is serendipitously thematic, and such was the case tonight, as I departed the bad art auction at Tether Design and the company of intrepid subculture explorers and bad art connoisseurs Jo and Marlowe to grab a nightcap at Fuel, a sports bar that is utterly generic with the exception of a series of impossibly bad portraits of the characters in "Caddyshack." However, it subsequent visits, Fuel has grown on me a bit. It has hosted some outlandish events (e.g. "Hot For Teacher Night" with Mary K. Letourneau and her DJ husband (and erstwhile student Vili Fualaau). 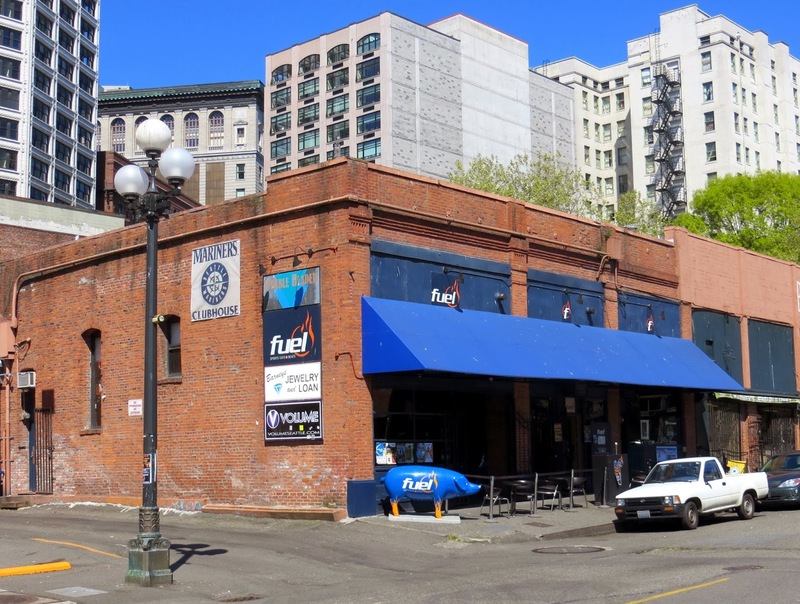 Also, if you want a rollicking place to watch Seahawks games and other Seattle sporting events, Fuel is one of the best bar scenes in the area. Historical notes: I have not yet found any bars in this location after prohibition until Fuel opened here in 2006 (before Fuel it hosted a tile shop and an Italian restaurant). However, going further back it is associated with a rich part of Seattle bar history. The building was constructed for Captain James Nugent and John Considine in 1890 (seattle.gov), right after the Great Seattle Fire of 1889. Nugent leased the Fuel portion from 1890 to 1904, and for at least a portion of that ran the Coocoo Saloon there. A saloon of unknown name was there in 1905 run by Rees Heycock. For a description of the more notorious eastern portion of the building, see my entry on the Double Header.